Soli Deo Gloria, “Glory to God Alone,” was one of the Five Solas of the Reformation. They were: 1. Sola Scriptura—”By Scripture Alone,” 2.Sola fide—”by faith alone,” 3. Sola gratia—”by grace alone,” 4. 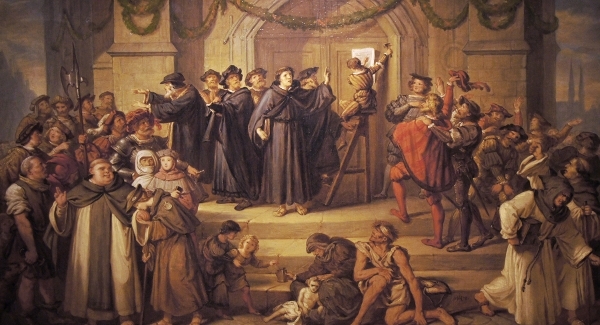 Solus Christus or Solo Christo—”Christ alone” or “through Christ alone,” 5.Soli Deo Gloria—”glory to God alone.” The Reformers specified these Five Solas as central, biblical truths that contrast with the corrupt doctrines of the Roman Catholic Church, but today, Protestant and Evangelical churches forsake them with little thought. In this article, we will see the significance of “Glory to God Alone” as taught in the Bible, look at how Catholic dogma contradicts this, briefly point out the many ways Protestant and Evangelical churches have abandoned soli Deo gloria, and conclude this series of articles with a question posed by our Lord.